When it comes to psychic channelling there are various ways an empath can carry out such an experience. On occasions, psychic channelling consists of the empath sitting in the lotus position, tuning into spirit and speaking inspired words that just seem to flow through her. Other times the empath will channel Spirit through tarot cards, or gain insights from numerological and astrologically guided charts. Some psychics however use gemstones to tune into paranormal messages. 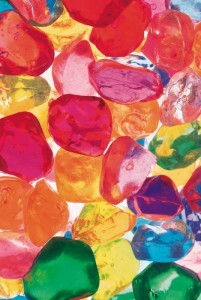 Amy Zerner and Monte Farber describe the use of gemstones in their book “Magical Messages from the Spirit World”. For example if your question is “How can I improve my marriage?” and the empath receives the garnet gemstone as her answer she could inform you that passion is lacking in your relationship. Garnet is bloodlike in colour and has a powerful influence on romantic love, sensuality and sexuality. It also embodies the spiritual awareness of compassion, say Amy and Monte. However other channelled information might come through in the form of a delicate green jade stone, which creates a protective energetic field around an individual. It also balances the future plans of those who wear it and draws success and abundance into a life. Jade also stimulates mental faculties and aids decision making. When a psychic channelling recommends Jade you will see yourself becoming more inspired and creative. Turquoise, and it’s beautiful “blue” colour, is super protective and frequently used by the Native Americans as it also gifts its wearer with an ability to speak from the heart. It reflects the colour of a sky clear of clouds and storms, its blue is inspiring and intense. American Indian shamans used it to hold their tribes back from pitfalls or problems. If the psychic is channelling a turquoise for you, be sure you are about to build a new and fun social circle, rich with opportunities! When a psychic channelling suggests diverse stones and crystals to help you through a challenging time, it is always wise to pay attention. If Agate comes through, for example, the psychic will tell you to be brave when faced with difficulties. Amethyst calms down negative energies and is excellent protection for stressed out environments, or those who work with computers all day long. It also opens us out to higher consciousness and can release any emotional trauma that blocks our evolution. Citrine also lifts up our minds to new possibilities as it draws in financial luck, and relaxes our central nervous system. It is a cute, bright yellow stone, and is well known to untangle anxiety in the solar plexus area. The psychic will always advise you that to strengthen the auric field, clear out negative energies and attract good luck quartz crystals are wonderful. Add to that, the fact that they are great emanators and receivers of energy, and you have a virtually perfect stone. They can also morph other precious stones and be programmed like a computer, to vibrate good luck and love. They are also used in watches, TV sets and complex communication machinery, such as cell phones, and iPods. Their capacity to hold energy is superior to most other stones and when used to send long distance healing, the results are phenomenal. For those beautiful goddesses out there, take note that the Moonstone is excellent for your protection. If a psychic suggests you use one, realize that it will protect you if you travel, or go near water. It will also open out your heart to even more love and calm down moodiness during the menstrual cycle. The empath will always advise you to clear out your stones. If you chose to get some for yourself place them in salt water and then in the sun for 24 hours and this should block out any negative energies from flowing through them. The fact is psychic channelling is varied in its expression, but it can help us find original ways to ever more love and light. Channelling answers through gemstones and crystals is one of the more accurate ways of discovering metaphysical answers to life’s problems and a healing one at that.